A dining companion suggested going Immanuel French Kitchen for dinner on a weekday and we arrived just as it was opening. Located at a coffeeshop in the Alexandra Village Food Centre vicinity opposite Alexandra Hospital and Queensway Shopping Centre, it is one of the stalls at Salute. Others include Stew Küche (it means kitchen in German) serving Swiss-German food, Seasalt – The Seafood Place and Two Wings. Upon reaching, we saw blue and white tablecloths on tables atypical of the usual coffeeshop layout. We were asked how many people we had and for a moment, I was reminded of the touting at Newton Food Centre where seats would be arranged for customers who then felt obliged to order from the particular stall which helped to find tables. With the assurance we could order from any stall regardless of where we were seated, we allowed a table to be arranged for us. After checking out the menus, we proceeded to order from each and pay. 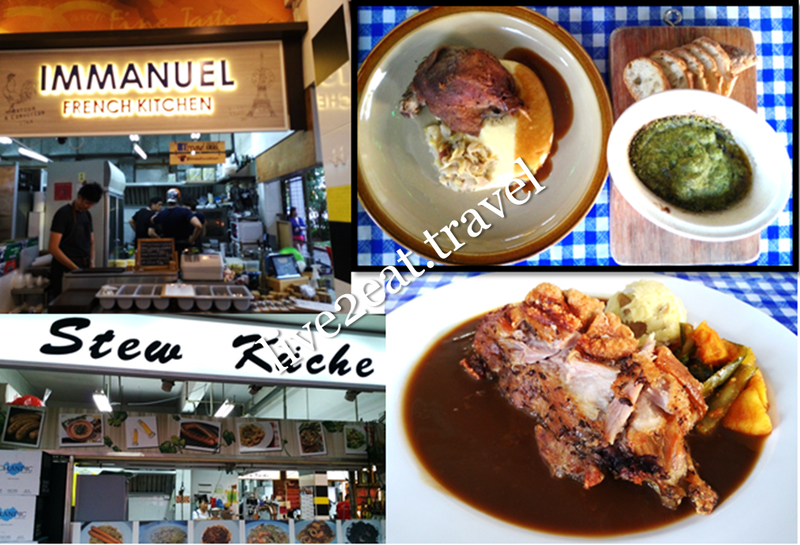 Immanuel French Kitchen is opened by Chef Immanuel who had worked at Restaurant Andre and Guy Savoy in Singapore among others. Started with an entrée of Burgundy Escargots – could not rave about the half-dozen of de-shelled snails which was a tad bland on its own, though the tomato fondue and garlic herbs butter they were baked in was perfect for dipping the bread served alongside. This was followed by a main course of French Duck Leg Confit with mashed potato, braised cabbage and au jus. While the meat was tender with crisp skin, one of us found it too gamely while another thought it could be tenderer. Definitely not outstanding, just like the creamy smooth mash. Looking like sauerkraut, the cabbage tasted nothing like it and was out of place in this French dish. If I were to give it a second chance, would probably try its Foie Gras, Frog and/or Pork Belly. Ordered German Pork Knuckle from Stew Küche served with homemade mashed potatoes (again), brown sauce and interestingly achar. Had just a Half Knuckle so we could try items from other stalls too and the meat was sitting on the gravy instead of the latter being served separately. Nicely-marinated and fully oven-baked, the meat was succulent and melt-in-the-mouth-tender with crispy crackles that only I enjoyed. They found the skin too thick and hard, felt the amount of fats were overwhelming and some even thought there was a gamely smell and taste in the meat. Oh well, everyone have their preferences and this was my favourite among our orders. Would have been better had there been sauerkraut on the side and beer to wash it down. I will likely be back for its bratwurst and rosti. Decided on Fresh clams in a Pot cooked Aglio Olio style from Seasalt – The Seafood Place, which we preferred to mussels. Our choice over Tomato Vongole and Garlic Cream was so the lack of freshness could not be masked. And of course, how bad could Aglio Olio be? Fresh without any reminiscence of mud or sand, the clams were sweet and cooked just right. In a lovely sauce with carrot strips, garlic and mushroom bits among others which went so well with the accompanying baguette slices that we could not resist mopping it up and dry. Topped with parsley, the portion was not pathetically small and was in fact so delicious everyone loved this dish. My 2nd favourite, I say. 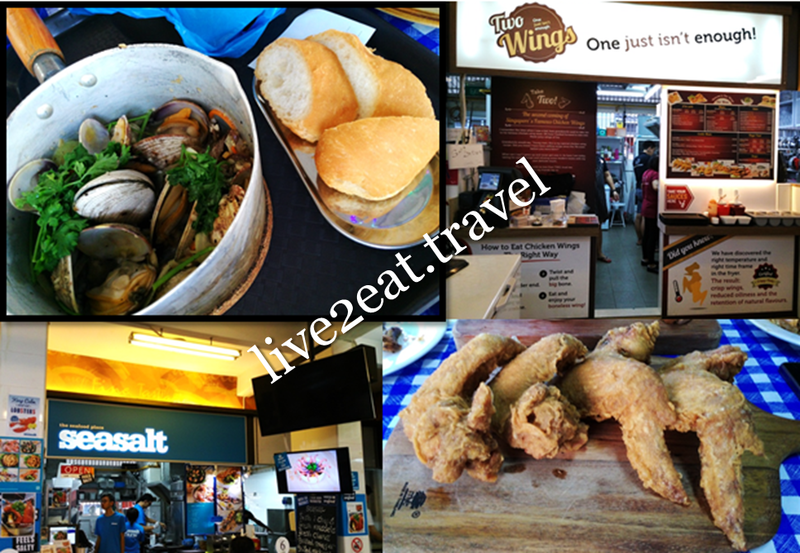 Two Wings was named as one of the best fried chicken wings in Singapore, worthy of your calories. So we shared a platter of four – one each, though the tagline reads "one just isn't enough". Was also recommended its cheese fries and we were glad for not succumbing to sales tactics as we were too full to stomach any more food, especially carbohydrates. As I was busy eating, did not see the message informing that our order was ready on my mobile phone. It was thus served to us instead, on a wooden board without the chilli sauce I overheard being strongly recommended to another customer when I was ordering. Not that the juicy and tender chicken wings with a crisp batter, which were well-marinated but not overly so, needed any accompanying condiments. The wings were good and not oily but we have had as-good-if-not-better and cheaper ones.